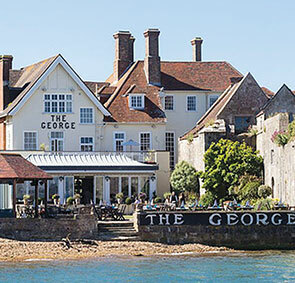 Originally opened in the summer of 2015 it now one of the most popular places to eat on the Isle of Wight. 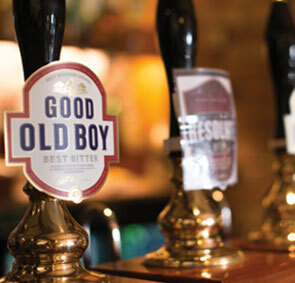 The vibrant rustic restaurant offers diners a wide choice of both meat and vegetarian options with sumptuous steaks, brilliant burgers, specialist cheeses, the finest local ice creams, and a regular rotation of seasonal specials. 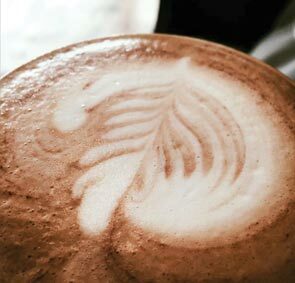 We are going to blow our own trumpet here because we believe our coffee is up there with the best! Our tea selection is also guaranteed to blow you away. The Farm Park occupies the old dairy building where once 800 cows patiently queued up to be milked. Now there is a soft play barn, animal encounters, giant jumping pillow, straw bale barn, outside paddock with wallabies and café. 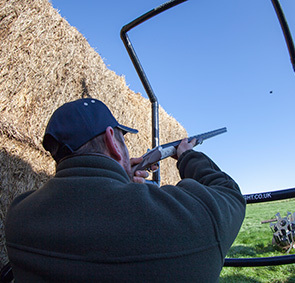 Top Targets provide a clay pigeon shooting and rifle range that is suitable specifically for corporate entertainment, stag and hen parties, private groups and individual beginners, with over 70 years of combined experience of shooting sports to help you with hitting the target. 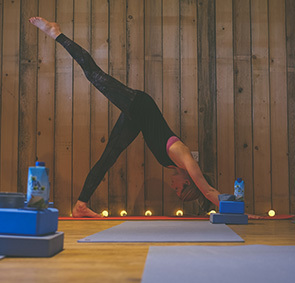 Bespoke private and group sessions available from £35+ (dependent on group size), suitable for those with or without yoga experience – adults and kids alike. Feel energised, revitalised and relaxed, Jenny will ensure the session is tailored to you and your group. Jenny is also a qualified kids yoga instructor (age 4+) so why not gather a group of little ones together for a fun yoga adventure. We also have regular public classes at the farm for guests to book, we’ll let you know if there are any planned during your stay. is a vintage travelling wood fired pizza oven. 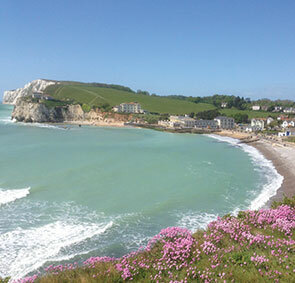 On a Friday night in the summer, they park up at Freshwater Bay from 5-8pm. Check them out on Facebook to find out other locations they might be on other days of the week- these change. This is an outdoor track, but open in pretty much all weathers! 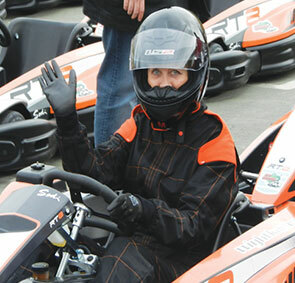 Gear up & get your racing suit on! 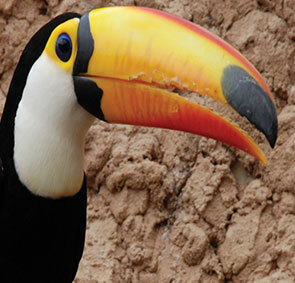 Amazon World Zoo Park has a huge range of unusual rare and exotic animals. 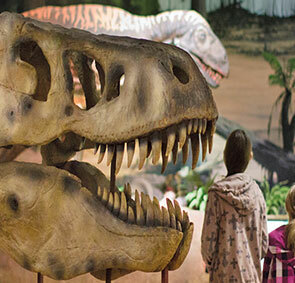 At the last count it was somewhere in the region of 200 different species, spanning the entire animal kingdom! The Island Wellness Spa is a place for you to enjoy natural and holistic therapies that will make your body and mind feel relaxed, rested and restored and your skin glow. It’s raining — is there any better excuse to drop your husband with the kids and escape for a massage until the sun reappears? For groups, it can also be arranged for a massage or two in your accommodation. 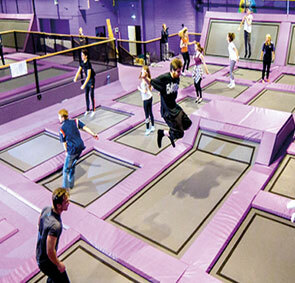 Trampolines, dodgeball, foam pit, basketball and café. Aimed at adults and children of all ages. 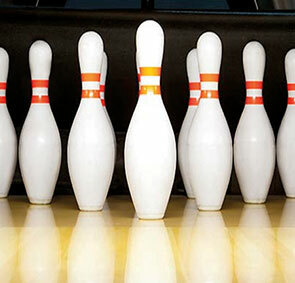 Ryde Superbowl offers full bowling facilities and a fully-licensed café-bar, open seven days a week, 364 days a year. 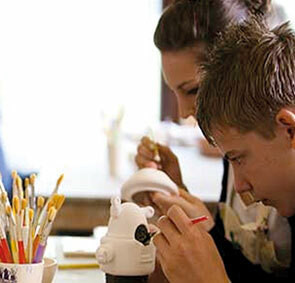 Chessell Pottery is a small working pottery on the Isle of Wight, where you will find a pottery painting studio, gift barn and award winning café. 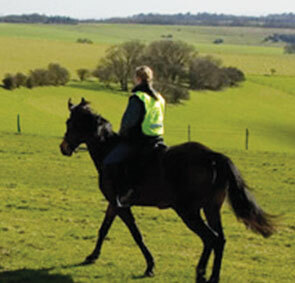 There are some great opportunities to go horse riding on the island — what better way to discover the awe-inspiring coast and countryside. 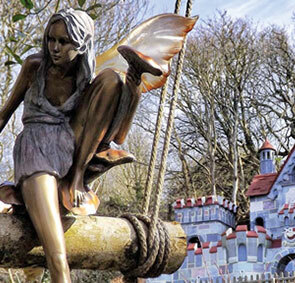 Overlooking the south coast of the Island, Blackgang Chine offers an eclectic mix of attractions, magical theme worlds, exciting rides and new adventures around every corner. 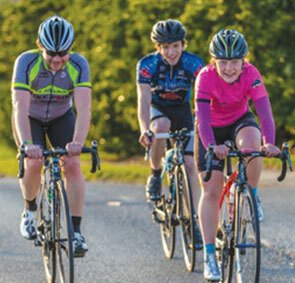 They offer day hire for £14, with free delivery island wide if the total fee is more than £25 (2 bikes or more). Booking needs to be made before 3pm the day before. Hire includes: helmet, lock, maps and maintenance support. 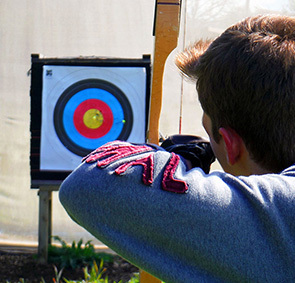 Sign up to a day with our friends at Island Adventure Activities (HQ located on Tapnell Farm) and for paddle boarding, bushcraft, mountain boarding, climbing, target sports, and coasteering activities, to name but a few. The perfect place to take the entire family. You can grab some scrumptious food from the café or garlic inspired produce from the shop and the sprawling grounds are ideal for children to explore. 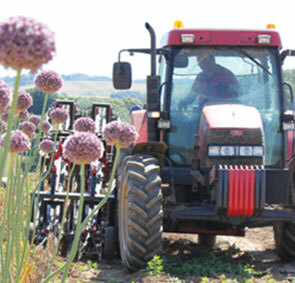 Set in 88 acres of beautiful countryside, Robin Hill, the Island’s favourite award-winning country attraction. 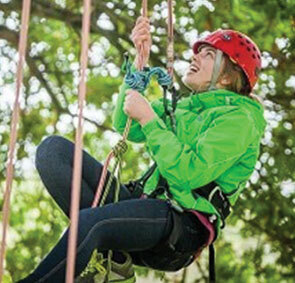 with great rides – including the 1/4 mile downhill toboggan – amazing falconry displays, adventure play for fun loving families and children, plus relaxing woodland gardens, ponds and walks. 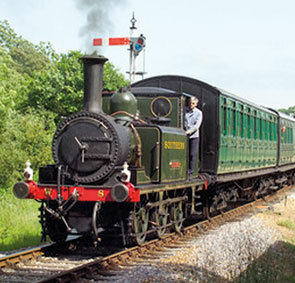 Take a Ride behind one of the vintage steam locomotives for a journey back in time. 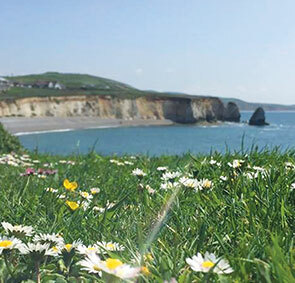 Breathe in the evocative smells of a real steam railway, settle back in beautifully restored Victorian and Edwardian carriages and enjoy a unique view of some of the Island’s unspoilt countryside. A gracious 17th century former townhouse located right on the water’s edge between the castle and pier in Yarmouth. Grab a pint of ale, watch the yachts bobbing up and down in the harbor and catch a glimpse of the ferries. National Trust run café in the Victorian coastal defence and secret rocket testing site perched high above the Needles Rocks. 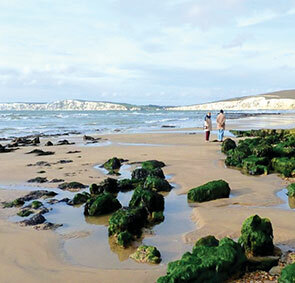 Limited disabled park, 3/4 mile walk from Alum Bay car park. 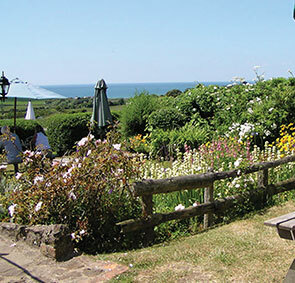 This 600-year-old pub is nestled in stunning, sheltered countryside near Brook Chine on the southwestern coast of the island. The beer garden is a great place to gaze out across the sparkling open sea. 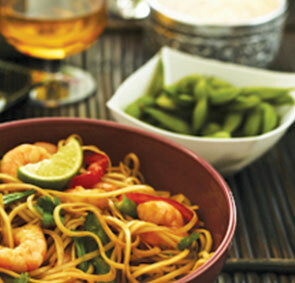 This is the perfect place to catch the sun setting in the west with a glass of wine and a helping of King Prawn Linguine from the new “Mediterranean Kitchen.” Live bands also play every Friday. 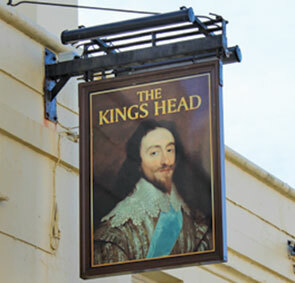 There are lots of great pubs in Yarmouth, but you’ll find the biggest selection of Ales at the Kings Head! 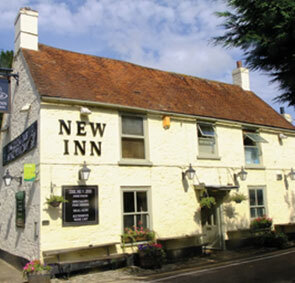 A lovely little pub set in a dip specializing in fresh seafood dishes as well as other local produce. 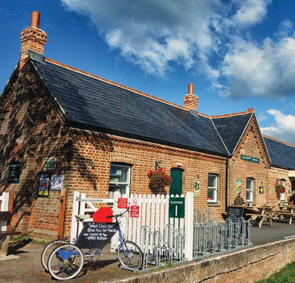 Few pubs can match the picturesque setting of Freshwater’s Red Lion pub — it’s tucked away next to a church and reachable via small country lanes one end and sleepy town thoroughfares the other. 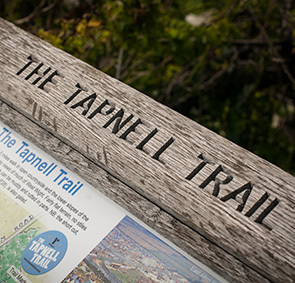 You can walk there from Tapnell! 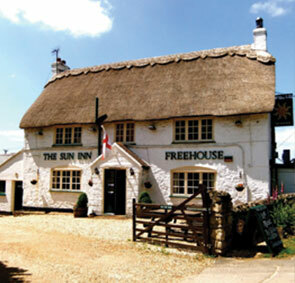 A short drive and you can be sitting in this 600-year-old pub’s beer garden sipping thirst-quenching ale while soaking up glorious views in no time. It’s a sheltered spot right in the sticks. The shortest of ambles from our accommodation, the Co Cow bar offers beer, cider, and cocktails. You can also find the best burger on the island in the restaurant, that’s a guarantee! Ryde promenade stretches from the hovercraft terminal eastwards as far as Seaview. The pleasure beach stretching down past Appley past and then on to Puckpool. 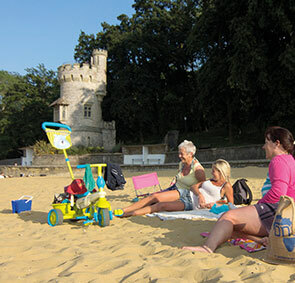 The fine sandy beaches have numerous entrance points from the promenade and deckchairs, sun loungers, windbreaks and other items can be hired on the beach. Watersports are popular towards the eastern end, especially kitesurfing. Only a few minutes from Tapnell Farm, this bay has it all — cliffs, a long beach, shelter from the wind and a great swimming depth. Please be wary taking children to this beach as there can be a sudden dip followed by strong tides. 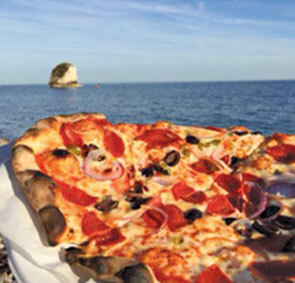 Keep an eye out for the Wightwood pizza van where you can buy delicious, hand made pizzas to regain energy after a paddle, every nice Friday 5.30 – 7.30 throughout the summer! 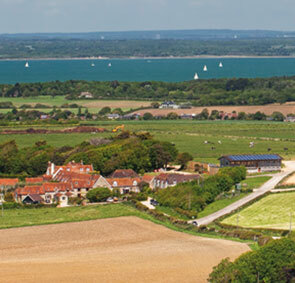 Again, you can reach Colwell and Totland Bays in a matter of minutes from Tapnell Farm and once there you will find a charming seafront that merges with a shallow expanse of water stretching far out into the ocean. It’s possible to paddle out hundreds of meters and still be able to stand in the shallow waters. Head to The Hut afterwards for a glass of rosé, burger or sea food platter! One of the island’s best kept secrets, Compton Bay is a two mile stretch of golden and dark sands framed by multi-coloured sandstone cliffs. If sand is not your thing, then you can relax on the grassy knolls overlooking the beach or climb on a board and surf some waves. Only a short drive from Tapnell. Once a Victorian golf course the Duver is now maintained by the National Trust. 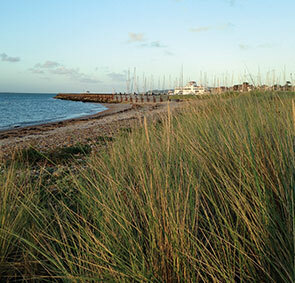 The Sand dunes are bordered on the south by Bembridge Harbour and the Solent to the north. There are the ruins of St Helens Old Church and sea wall with brightly coloured beach huts and an excellent beach café. 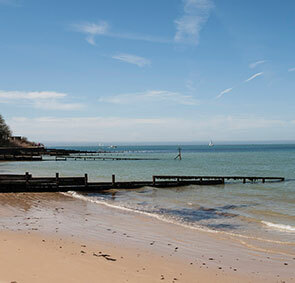 Just round the coastline from Ryde, this beautiful secluded beach can be accessed at low tide if you are walking around from Ryde seafront. Don’t forget to check tide times first to ensure you can get there and back in time! 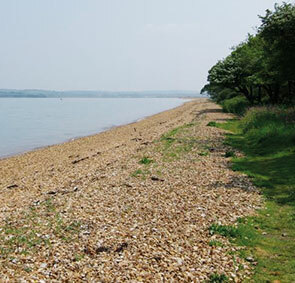 A fascinating shoreline for fossil hunters and bird watchers. Not one to visit if you want to go for a swim or sunbathe, but if you have a young Christopher Columbus with you then this is the perfect spot! 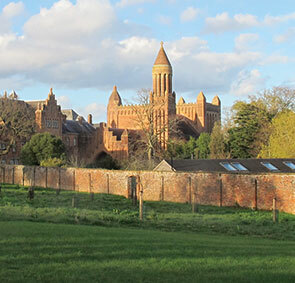 Quarr Abbey is often dismissed as just a monastery, however it is a beautiful picturesque spot for a stroll. 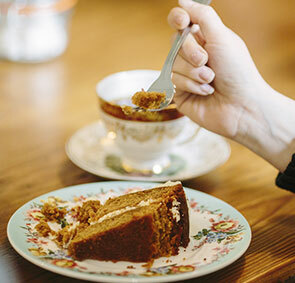 They also have a gift shop and tearooms with tasty local produce to eat or take home. 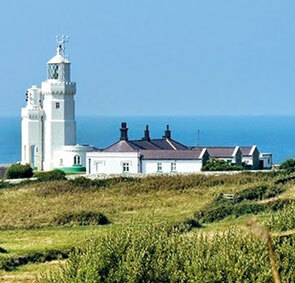 The view from the walk down to the lighthouse is stunning – imagine dramatic cliffs and tumbling landslips with St Catherine’s Lighthouse perched on the edge. 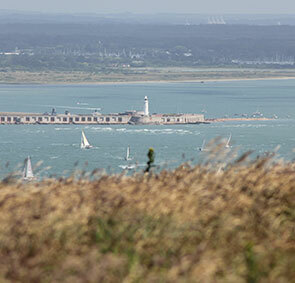 Tours of the lighthouse are very reasonable; however, the best bit is soaking up the unspoilt surroundings. 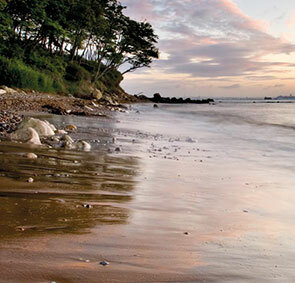 Steephill Cove is an unspoilt fishing cove with a safe, sandy beach. With only a handful of cottages, deckchairs, beach huts, lobster pots and an old donkey and not a slot machine, car or burger in sight. 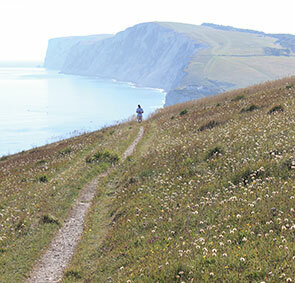 Surrounding the Cove are fantastic coastal walks. 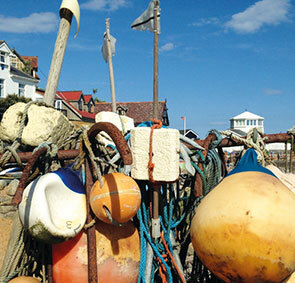 Go west to the Botanical Gardens or east to Ventnor. 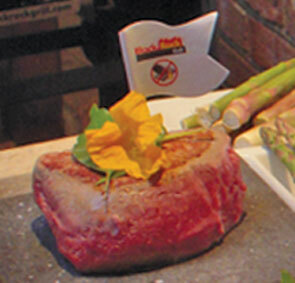 The island’s only specialist Black Rock Grill experience! The food here is exceptional, especially the steak. This place is only 10 minutes drive from Tapnell Farm and has character in abundance, there’s no doubt about it. 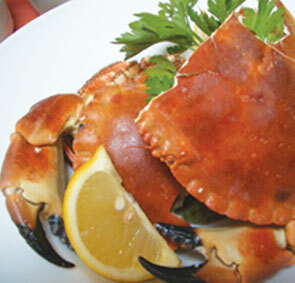 The restaurant has a well-earned reputation for serving the best local fish and shellfish. 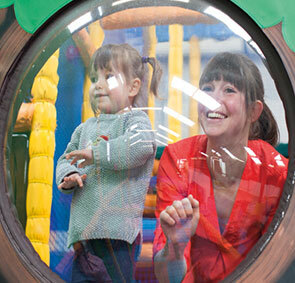 There’s always a fun and lively atmosphere and friendly staff. 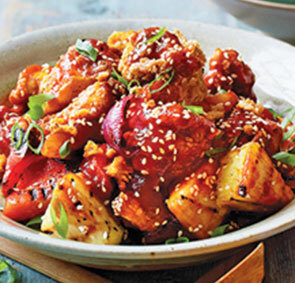 We recommend any of the daily specials — always fresh and delicious! 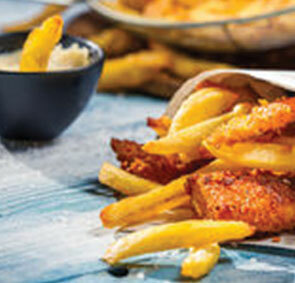 Created by the owners of The Hut, Colwell, The Grill is a relaxed and stylish take on the classic ‘charcoal grill’, with no nonsense food where flavours speak for themselves. Sunny seaside hangout in the day and atmospheric restaurant in the evening serving mouthwatering cuisine from lobster to catch of the day. 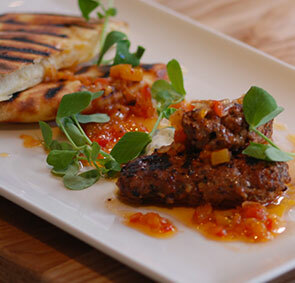 Thompsons Restaurant is a contemporary ‘open kitchen’ restaurant offering a delicious modern British menu inspired by the flavours of the Island and Robert’s Experiences. 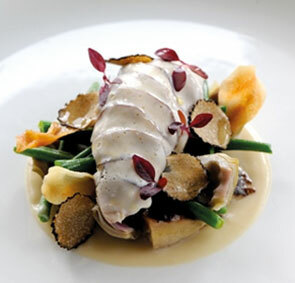 Owner & head chef Robert Thompson was the youngest British chef to receive a Michelin star and showcases the Isle of Wight’s produce and flavours in his food. 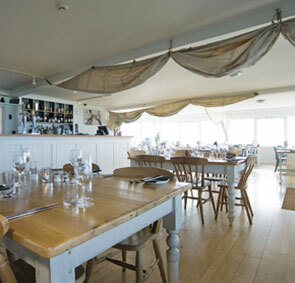 Little Gloster is a family run award winning restaurant with seafront views of the solent. Presenting simple seasonal food in relaxed Scandinavian influenced surroundings; it is the perfect place for a quiet meal or to celebrate a special occasion. 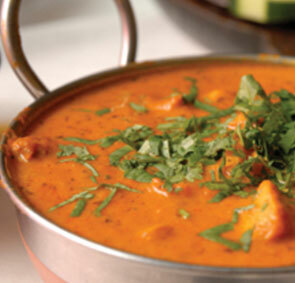 Indian food available for takeaway – 15 minutes from Tapnell. in Newport is a little further away but everybody that knows it loves it! in Totland is another Chinese we would definitely recommend. in Freshwater is perfect if you are in the mood for a Chinese. 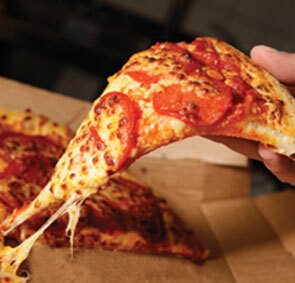 This family run business delivers free for orders over £12. in the local village Freshwater serves locally caught fish day and night times. Collection only. 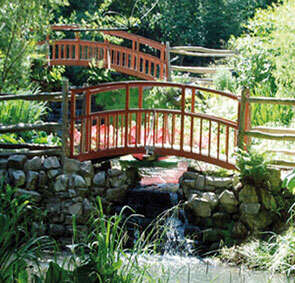 Once home to poet Alfred Lord Tennyson, the grounds are now home to a contemporary garden café with sunny terrace. 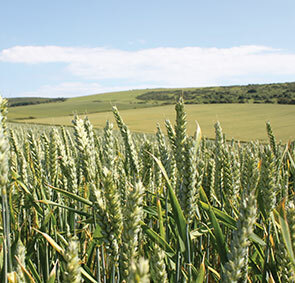 The perfect spot for a cream tea or light lunch. There is also a 9 hole golf course if you fancy some exercise as well! Overlooking Freshwater Bay (very close to Tapnell Farm) this café had a great selection of tea, coffee, and cakes so you can get a dose of quintessential Britishness while peering over the white cliffs. You can find one of the tastiest Eggs Benedict on the Island here. The eggs are always cooked to perfection, the toast is chunky, and the hollandaise sauce is to die for. The selection of teas is huge, from Earl Grey to Orange Blossom Oolong. 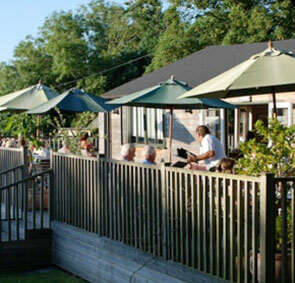 10% off for guests when you spend over £10, just mention Tom’s Eco Lodge. 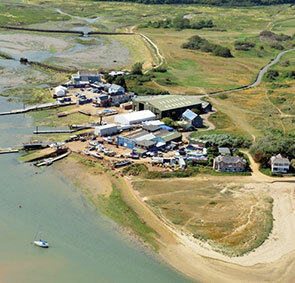 Enjoy a spot of bird watching across the wetlands while eating a full English. Off The Rails also cooks up a mouth watering vegetarian breakfast — you can walk back to Tapnell Farm afterwards if you feel like burning a few calories! 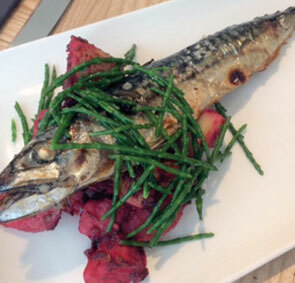 Fancy a full English before catching the ferry from Yarmouth? 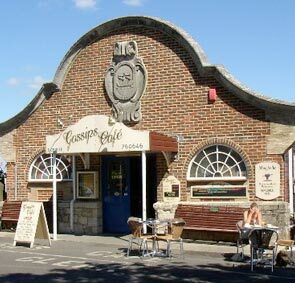 This café has the perfect location for a greasy fry up before a long trip home! 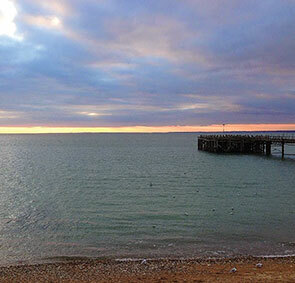 At the top of the pier, the café has great views of the solent. 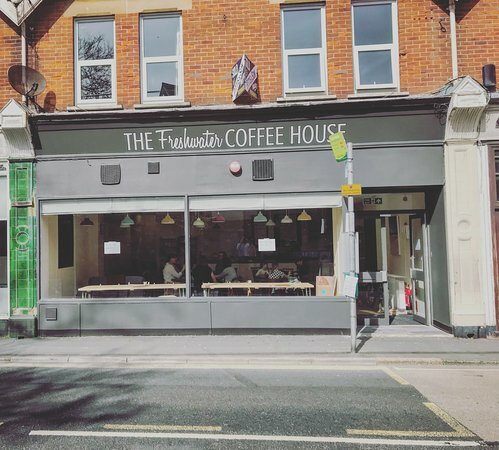 A family founded adventure- The Freshwater Coffee house is a favourite with both locals and those visiting. 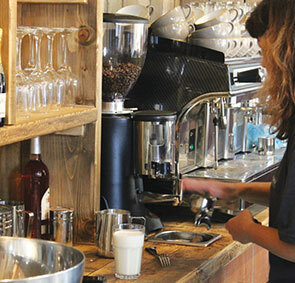 With a warm welcoming atmosphere and tasty food and drink, its worth a stop for breakfast, lunch or a quick coffee. Something to note- the closest parking would be at Moa Place a 2 minute walk from the cafe.